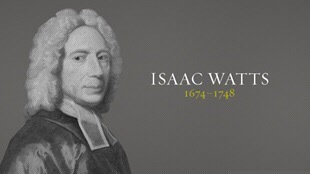 On this date in 1674, Isaac Watts was born. Watts changed the way the English church worshiped. Before he came along, Protestant churches in England and Scotland would only sing hymns that were rhymed translations from the book of Psalms. Which isn’t a bad practice, unless, of course, you want to talk about Jesus, the Cross, the resurrection or anything from the New Testament. Watts changed all that. In one sense, he was the English church’s first contemporary worship leader. Thanks to someone who dared to do what hadn’t been done before, we now have “When I Survey the Wondrous Cross;” “Alas and Did My Savior Bleed;” “Joy to the World;” “O God, Our Help in Ages Past;” and around 750 other hymns. What would he say today?